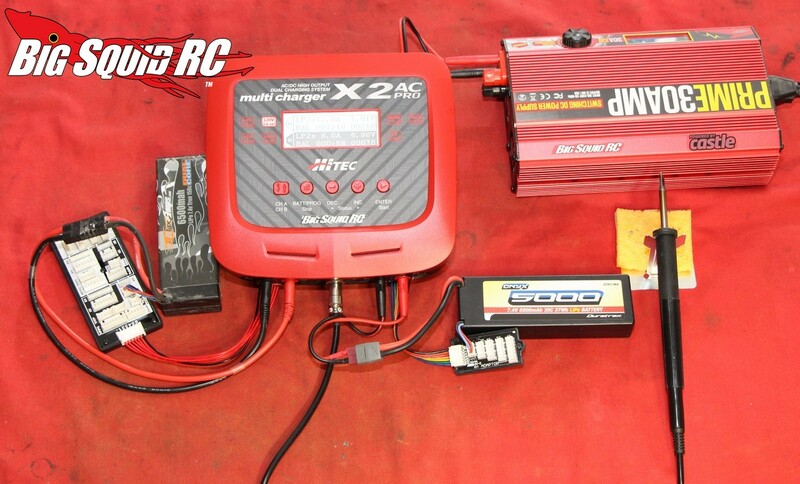 Hitec X2 AC Pro Charger Review « Big Squid RC – RC Car and Truck News, Reviews, Videos, and More! Primary Competition: There are none that come with a built in solder iron. Otherwise, it would be compared to other high output dual port chargers. What’s In The Box: Charger, AC power cord, DC input cable, universal balance board, XH balance board, charging wires, t-style charging wire, soldering iron handle, 2 soldering tips, soldering iron stand, and a sponge for the iron. Build Quality: The Hitec looked very well assembled out of the box. The connectors were well done and nothing was amiss. Testers: Tim, Iron Mike, Robbie G., and yours truly. Set-up Notes: We used the X2 Pro on both AC and DC power. 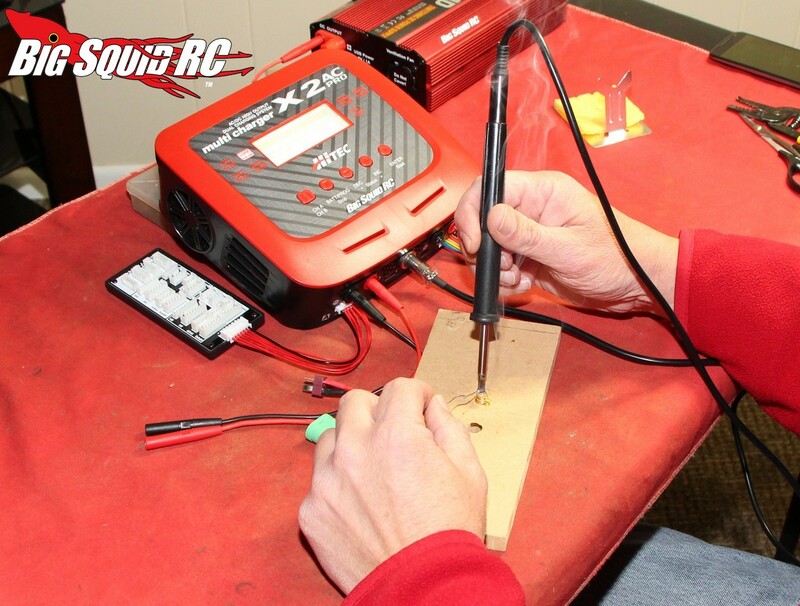 For DC we used a Racers Edge 30 amp power supply. 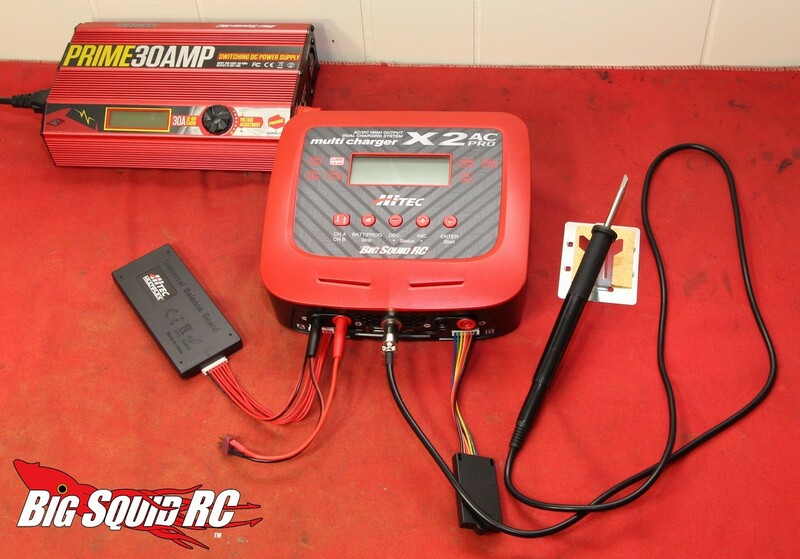 Batteries used included various MaxAmps and Duratrax Onyx LiPos. For NiMH we used ARRMA and Traxxas RTR packs. Ease of Use: None of our testers had a problem using the X2 Pro. In fact, none of them even had to refer to the manual during our testing period. Changing charge parameters was super easy, as was using the soldering iron. Power: With a maximum charge rate of 20 amps, the X2 Pro isn’t the most powerful thing you can buy, but is much more powerful than your “average” charger. We found it had more than enough power for our charging needs. On the Track: We found that packs charged on the X2 Pro did a great job when driven on the track. 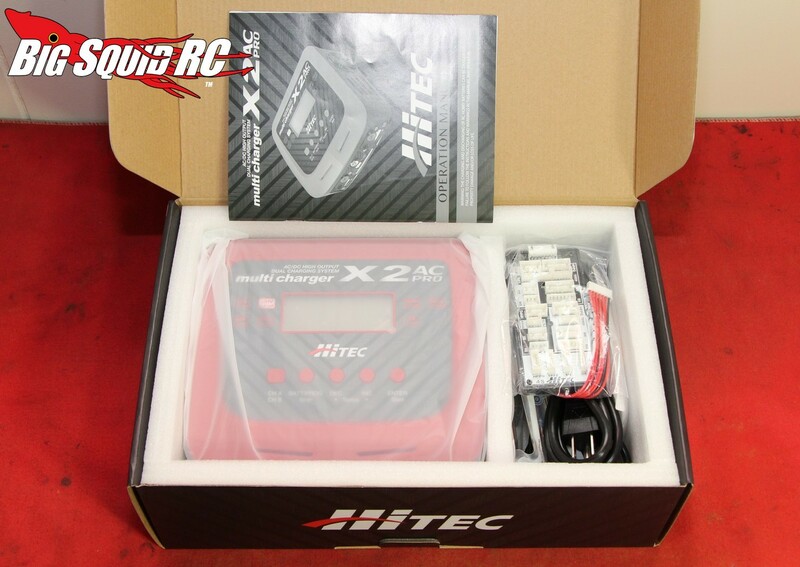 We compared the quality of the Hitec’s charge to that of an iCharger 308 and none of our testers could accurately guess which pack was being driven on the track. All our packs felt quite strong after a charge on the X2. 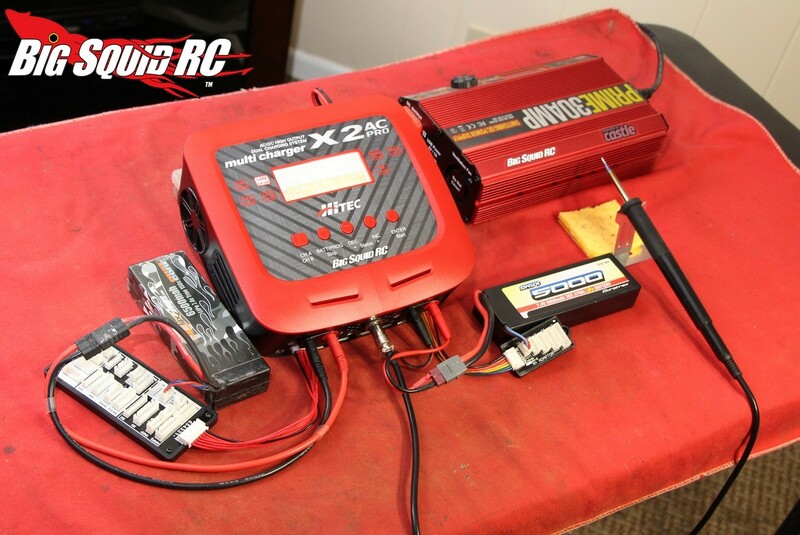 From a NiMH in a brushed RTR, to a 4S LiPo in a brushless truggy, all packs felt strong after being charged on the X2. 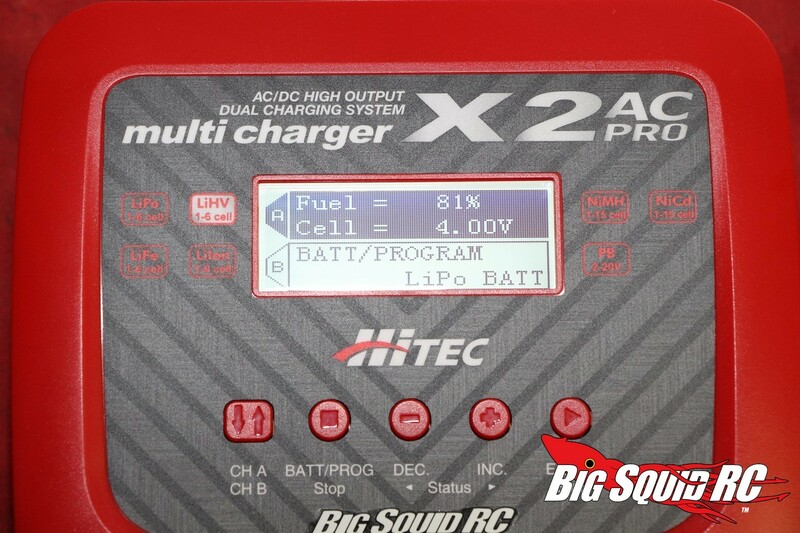 As you can see by the numbers above, the Hitec took longer to fully charge a LiPo pack than the iCharger. 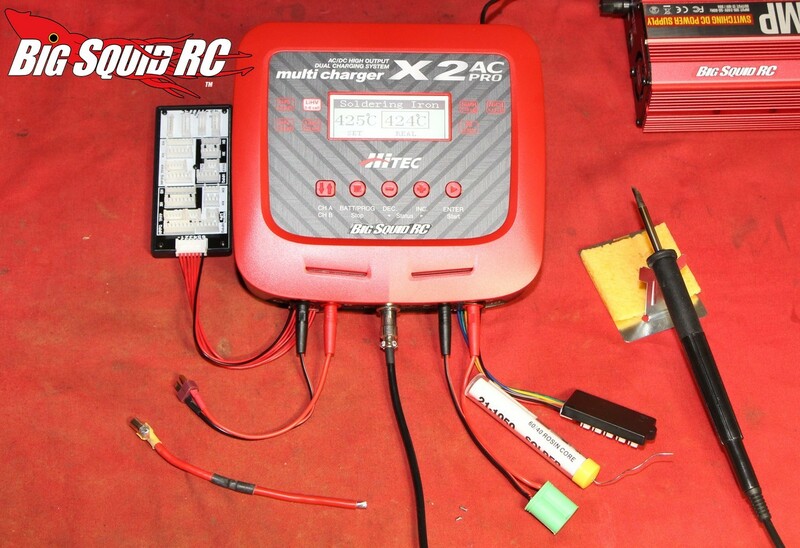 It took about an extra 10 minutes for the Hitec to fully charge a pack with both chargers in their “fast” modes. 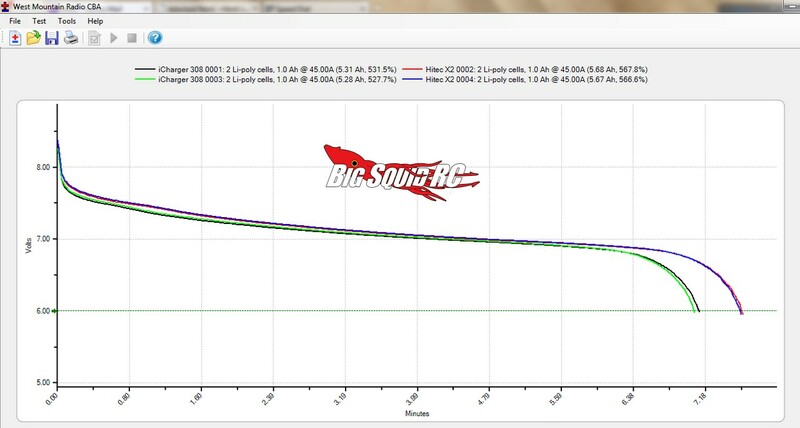 Output voltage at 45 amp discharge after 2C Charge Vs Reference: In this test we attempt to see how the actual quality of charge stacks up against our reference charger (an iCharger 308, highly regarded among the “racing crowd”). First, we do a charge, then discharge our pack at 45 amps on our West Mountain CBA. Then we start the test. First up was the iCharger, then the Hitec, then another run on the iCharger, then a final run on the Hitec. After each charge we discharged our pack on the CBA, then let it cool for 10 minutes (under a fan), then immediately start the next charge. 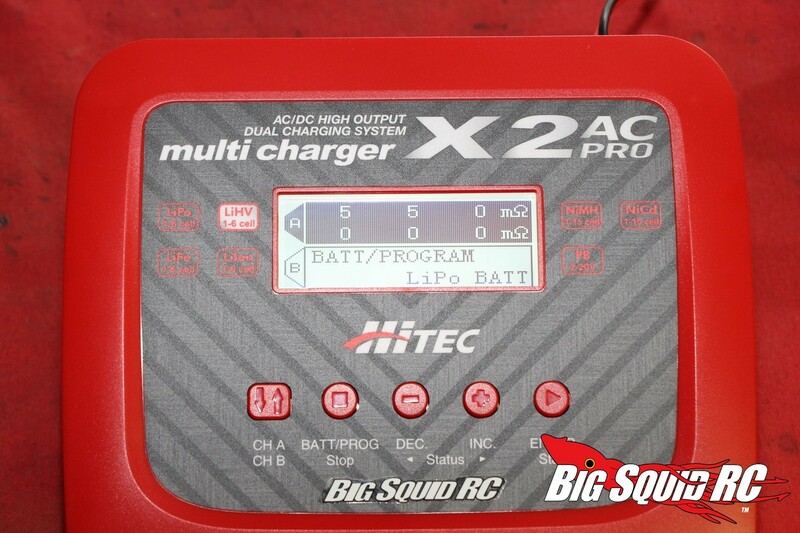 During this particular review, we used the “fast balance” charge mode on the iCharger while the “fast charge” mode on the Hitec was used. All charging was done at 2C. Compared to the iCharger, the X2 Pro did a great quality of charge. Quite simply, our test pack had more output voltage after being charged on the Hitec than it did when charged on the iCharger. Not only that, but our test pack also had more runtime. 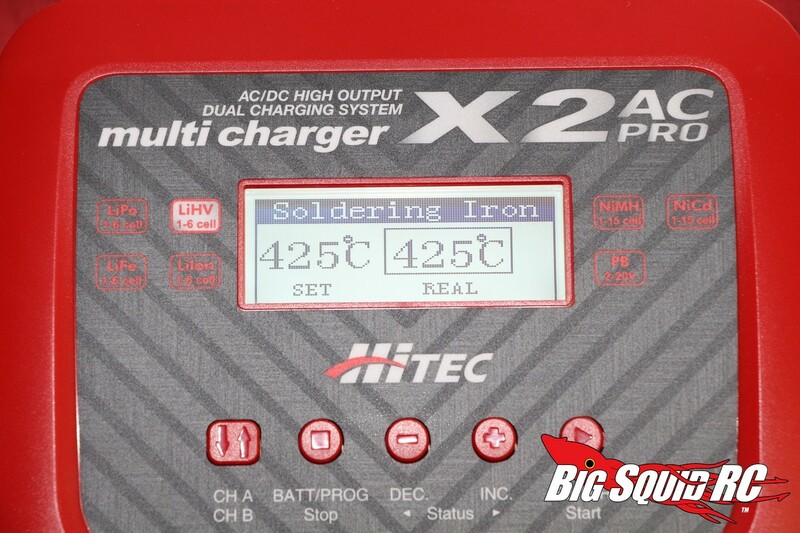 Those are the two main things you look for in a quality of charge, higher voltage and longer runtime, and the Hitec beat the iCharger in both categories. The alarm tone on the X2 Pro was louder than most chargers that we have used lately. While loud enough to be heard over the sound of various charger/power supply fans, it didn’t really get on your nerves because of how brief it lasted. 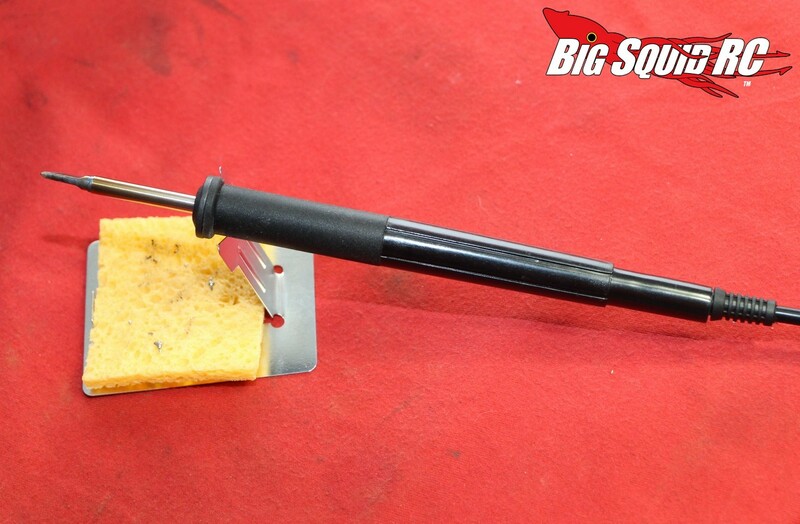 While the X2 Pro doesn’t take up a lot of space on your pit table, it isn’t super small either. We found the charge leads and DC input wire to be a bit on the short side. While we didn’t have a problem making them work, another 3″ or so would have been nice. 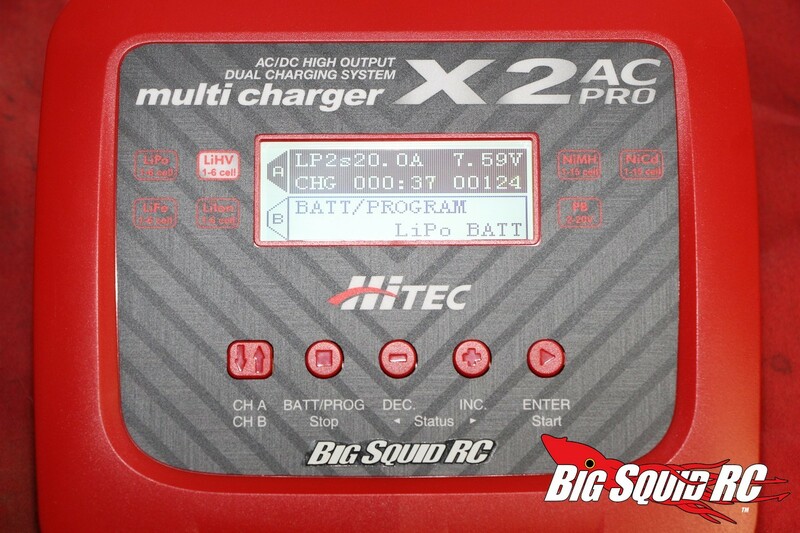 Being the curious sorts that we are, we compared the fast charge of the Hitec against its own normal charge. 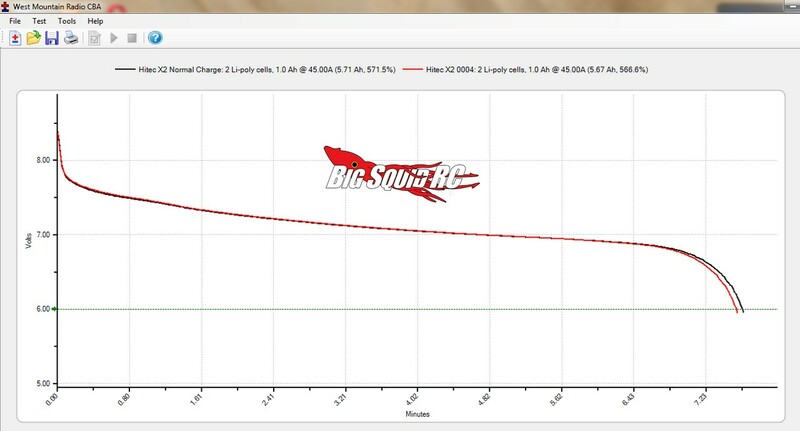 The normal charge mode added about 5 minutes to the charge time (43 minutes 35 seconds at 2C) but yielded an additional 5 seconds of runtime. Output voltage of the two different types of charges were about the same. The fan on the X2 Pro isn’t too loud. We hate chargers that sound like a jet airplane taking off, the X2 Pro was fairly quiet to use. 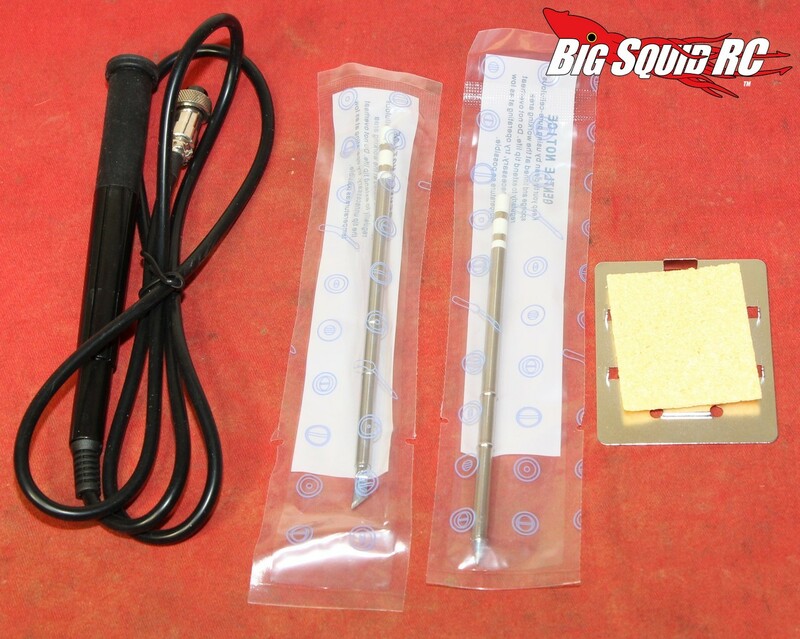 So… how about that soldering iron? It works Great! 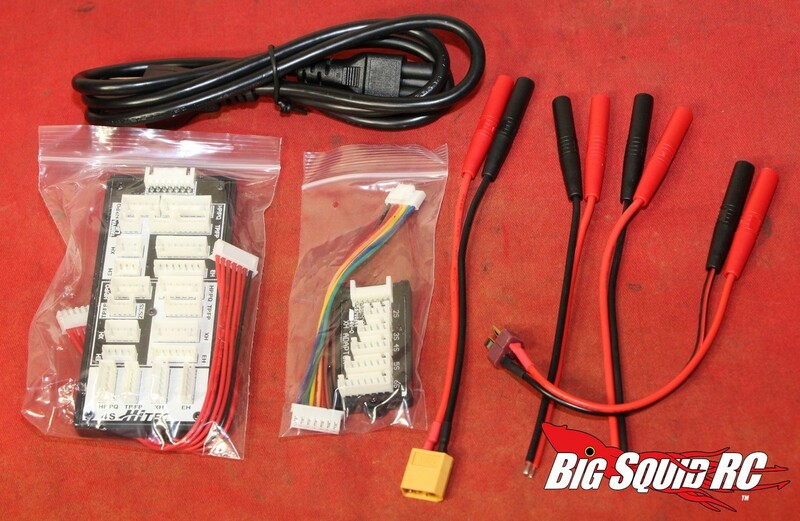 It comes with two very nice tips and had more than enough power to easily solder 10 gauge wire. Oh ya, it also works on DC power, which makes it extra handy when out bashing. How many times have you needed a soldering iron to fix a loose wire, but were out in the middle of nowhere with no AC power around? Being able to solder off of DC power is a great feature for the average basher. The included soldering iron stand isn’t fancy, but gets the job done. We found the display to be large and easy to read. It displays all the info that you are looking for, while being large enough for all us old farts to see. One of the coolest features on the X2 Pro is the ability to be used along with a smart device. The charger doesn’t come with the module required to do so and we didn’t get one in time for testing. The module runs about $20 and should really put the X2 Pro over-the-top for trickness when used. Time To Bash: B We found the X2 Pro very easy to set-up. It comes with one battery wire pre-soldered with a Deans, which was a nice touch. Car Show Rating: B Our Bash Crew didn’t think it was the best looking charger on the market, but all of them liked how it looked. Bash-A-Bility: A Like every product we get in, we treated it very poorly. After dropping it and trying to overheat it, our test unit come through with flying colors. Power: B While using it on AC power does reduce its output capability, on DC it can push some serious amperage. It can charge a pair of 5000mAh LiPos at 2C, which is no joke. 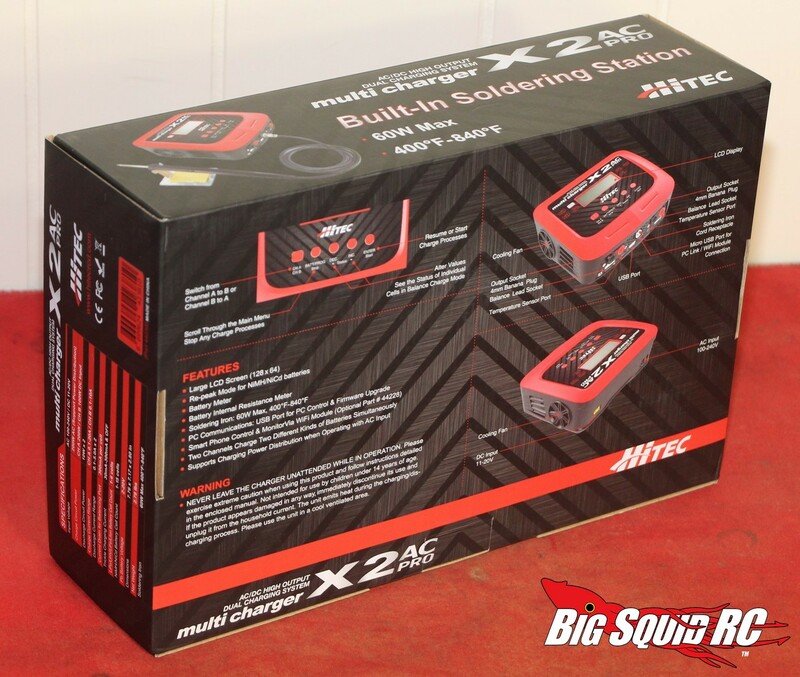 Value: A We feel that a first class battery charger, that also comes with a first class adjustable soldering iron, is a great value at a $199 price point. 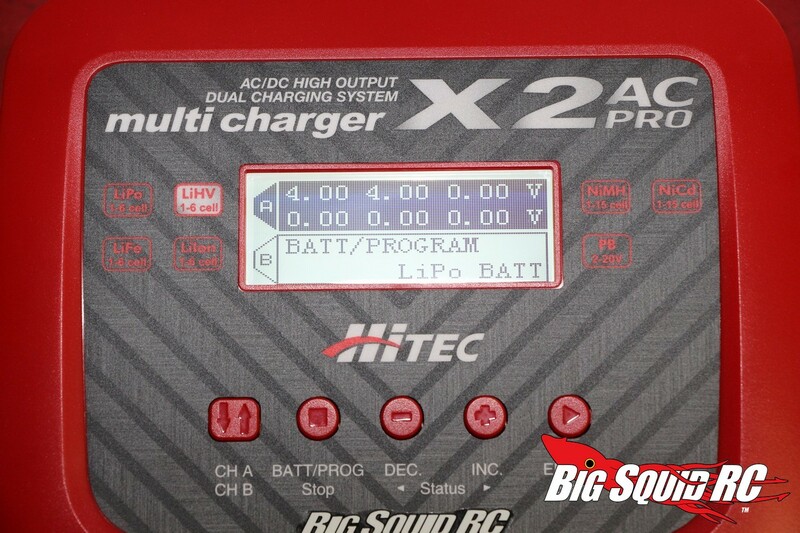 BigSquid Rating: A- We really, Really liked the Hitec X2 Pro AC. It has plenty of power and its built in soldering iron worked like a high-end unit. 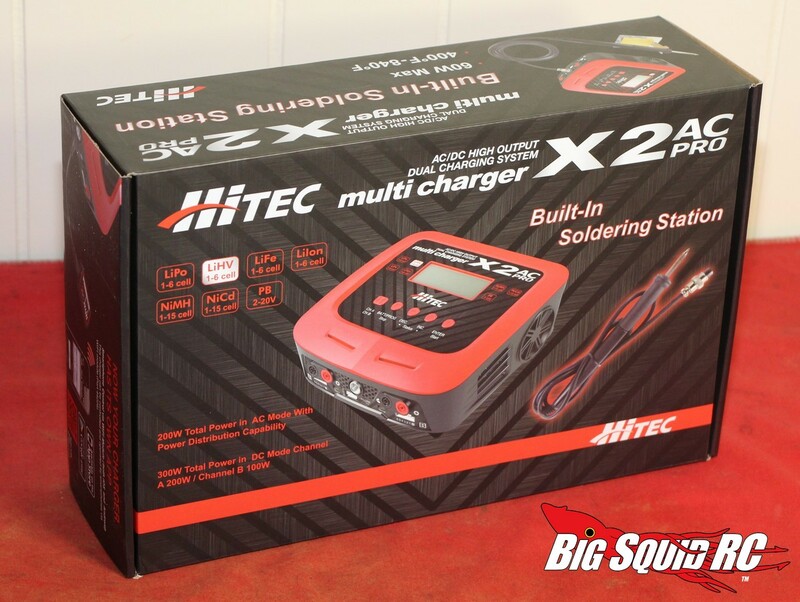 If you are looking for a great charger with a built in soldering iron, we can highly recommend the Hitec X2 Pro to you.